Santorini, an island in the southern Aegean Sea is around 200 km southeast towards Greece’s mainland and is the largest island of a circular and small archipelago bearing the same name as well as the remainder of a volcanic caldera. Santorini has been named by the Latin Empire during the thirteenth century which is referred to Saint Irene, from the old cathedral’s name in the village of Perissa, a contraction of the name Santa Irini. Prior to this, it was known as Kalliste – `the most beautiful one’, Strongyle, `the circular one or Thira and while Thira was used in the nineteenth century as its official name of the island as well as its main city, the name Santorini continues to be in popular use.Santorini is also a name for a group of islands encircling Thira which once formed a single island before a major volcano had occurred around 1628 BC.Forming the southernmost link of the Cyclades group of islands, it comprises of an area of around 73 square km with a population of around 15,550 as of 2011. Santorini municipality consists of the islands of Therasia and Santorini together with uninhabited islands of Aspronisi, Nea Kameni, Palaia Kemeni and Christiana and is also a part of the Thira regional unit. 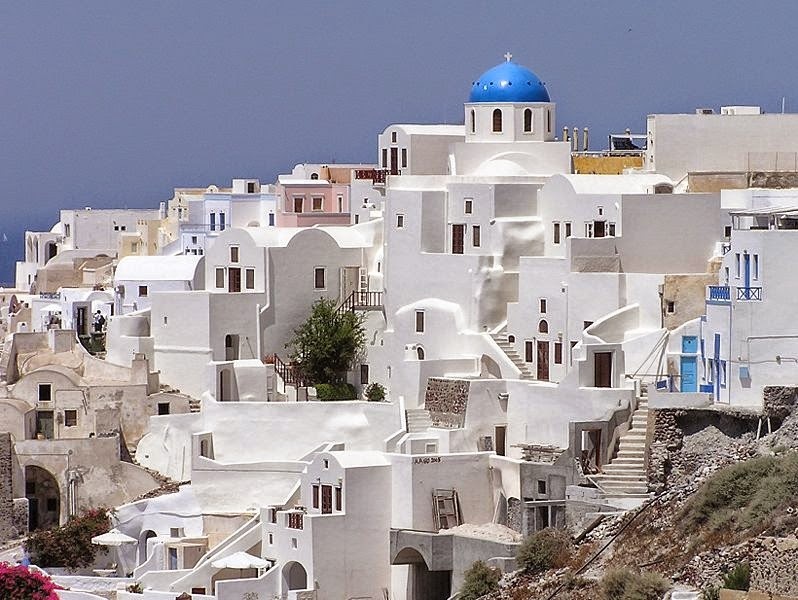 Being a volcanic island in the Cyclades group of the Greek islands, it is situated between Ios and Anafi islands and is popular for its amazing views with beautiful sunsets from Oia town, the strange white aubergine, town of Thira and its own active volcano. There are some natural beaches like the Perissa beach which is one of the best beaches in Santorini, together with Kamari, the black pebble beach, as well as the white and red beaches.Its main island has a variety of villages and landscapes and in the small village of Mesa Gonia, one can get the opportunity of glimpsing traditional architecture with a mixture of ruins from the earthquake of 1956 together with the restored villas and winery at the foot of the settlement. Another remarkable village is the Pyrgos which comprises of old grand houses, the remains of a Venetian castle together with some Byzantine churches which are worth exploring. Its natural source of fresh water in the form of a small spring coming from a cave behind a small chapel is located halfway up the steep footpath between Kamari and the entrance of Ancient Thira. Though this source provides a small quantity of water, the quality of water is quite good since it comes from the remaining limestone outcrop of pre-volcanic island and in the early 90s, it was essential for water to be delivered through tankers from Crete to the island. Now water is provided to most of the homes and hotels by local desalination plant and though this water is potable, it is a bit salty and hence most of them tend to drink bottled water on their visit to Santorini. It is an adorable destination of unique natural beauty where several Greek singers who chose this island as a setting for their videos. Some of the Brazilian and Greek TV series have also been shot at this location together with many other Hollywood movies such as Tomb Raider II.